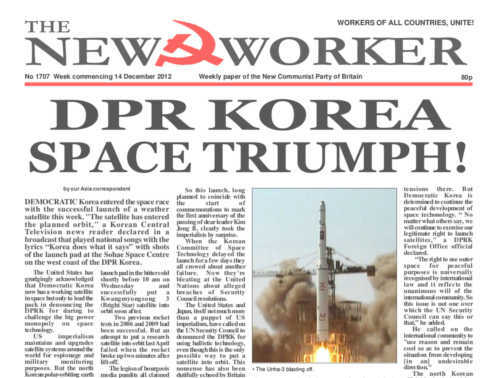 www.newworker.org | 14th December 2012 - DPR Korea space triumph! HOME Secretary Theresa May has been forced to withdraw and rewrite her Communications Data Bill, known generally as the “snoopers’ charter” after it provoked opposition from Liberal Democrat leader Nick Clegg and a significant number of backbench Tories, including former Home Secretary David Davis. ULSTER Loyalists last weekend rioted in east Belfast and one threw a lighted petrol bomb into a police car in which a policewoman was sitting.